As you can see in the above example, age property is attached to studObj1 instance. However, studObj2 instance will not have age property because it is defined only on studObj1 instance. So what to do if we want to add new properties at later stage to a function which will be shared across all the instances? Every function includes prototype object by default. The prototype object is special type of enumerable object to which additional properties can be attached to it which will be shared across all the instances of it's constructor function. So, use prototype property of a function in the above example in order to have age properties across all the objects as shown below. Every object which is created using literal syntax or constructor syntax with the new keyword, includes __proto__ property that points to prototype object of a function that created this object. You can debug and see object's or function's prototype property in chrome or firefox's developer tool. Consider the following example. As you can see in the above example, Function's prototype property can be accessed using <function-name>.prototype. 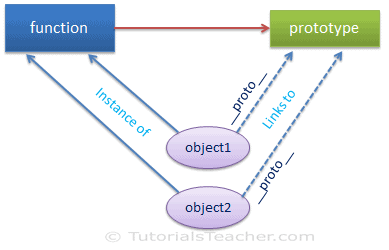 However, an object (instance) does not expose prototype property, instead you can access it using __proto__. The prototype property is special type of enumerable object which cannot be iterate using for..in or foreach loop. As mentioned before, object's prototype property is invisible. Use Object.getPrototypeOf(obj) method instead of __proto__ to access prototype object. The prototype object includes following properties and methods. constructor Returns a function that created instance. __proto__ This is invisible property of an object. It returns prototype object of a function to which it links to. hasOwnProperty() Returns a boolean indicating whether an object contains the specified property as a direct property of that object and not inherited through the prototype chain. isPrototypeOf() Returns a boolean indication whether the specified object is in the prototype chain of the object this method is called upon. propertyIsEnumerable() Returns a boolean that indicates whether the specified property is enumerable or not. toLocaleString() Returns string in local format. valueOf Returns the primitive value of the specified object. Chrome and Firefox denotes object's prototype as __proto__ which is public link whereas internally it reference as [[Prototype]]. Internet Explorer does not include __proto__. Only IE 11 includes it. The getPrototypeOf() method is standardize since ECMAScript 5 and is available since IE 9. As mentioned above, each object's prototype is linked to function's prototype object. If you change function's prototype then only new objects will be linked to changed prototype. All other existing objects will still link to old prototype of function. The following example demonstrates this scenario. In the above example, toString() method is not defined in Student, so how and from where it finds toString()? This way, prototype is useful in keeping only one copy of functions for all the objects (instances). The following figure illustrates the above scenario. 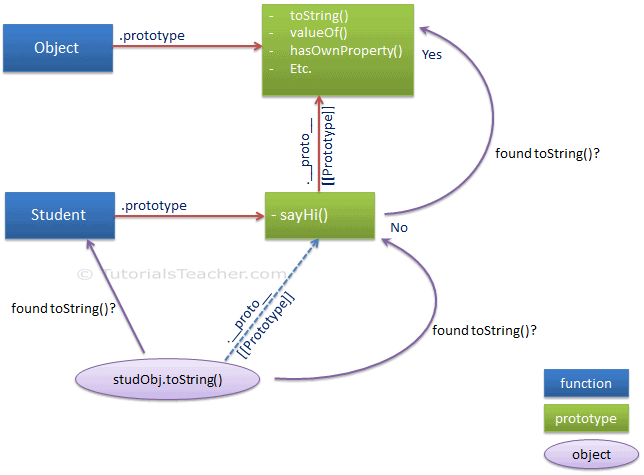 Learn how we can achieve inheritance using prototype in the next section.